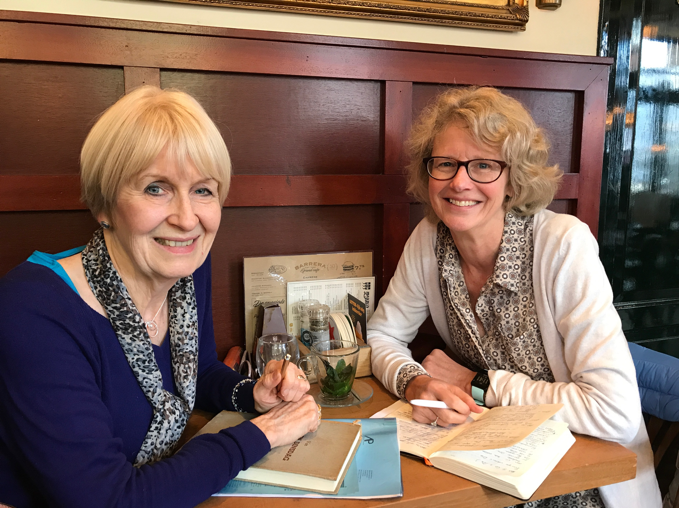 These days, a trip to Holland is never complete without a visit to Leiden to meet up with my publisher, Liesbeth Heenk, the founder of Amsterdam Publishers. This time, our meeting was pretty special as we’ve begun our discussions about working together on publishing my next novel, the sequel to The Hidden Village. We met at our favourite café in the centre of Leiden, the Café Barrera, a buzzy venue for students, academics and locals soaking up the atmosphere and fuelled by plenty of caffeine! It’s exciting to be at the start of a new journey to bring my new novel to fruition. I find it hard to believe that I’ve only known Liesbeth for 18 months. In that time, she’s taken the manuscript for The Hidden Village, edited it, provided extremely valuable feedback and suggestions for improvements and turned it into a professionally produced ebook and paperback. Completing the team was my son, Leo Johnson, who designed the front cover and so brilliantly captured the essence of the novel and the setting, which he knows so well himself, having spent many family holidays with us in the Veluwe. APublishers launched The Hidden Village in May 2017, first as an ebook and then a paperback. I was thrilled to see it become a reality and didn’t have any particular aspirations or expectations of success. But almost immediately, it began to rise through the amazon.com rankings and within a month was a bestseller in no less than six sub-categories, including Teen & YA European Historical Fiction. The amazonreviews began to flood in. many from people gripped by my story as it resonated with their own family histories from World War 2. I hadn’t thought about writing a sequel, but the more I delved into the history of this period, the more ideas I’ve had about writing further novels. My frequent trips to Holland have unearthed new research, meetings with people with their own wartime memories and the discovery of places with a special significance to WW2. Just yesterday, I read that seven allied planes had crashed in and near Nunspeet, one just yards from where we now stay. (I’ll be writing about this in my next post). Now that I’m close to finishing the follow-on to The Hidden Village, there is still so much to write about. Not just about the history, but imagining the lives of people and the decisions they were forced to make in order to survive. Whether this will take the form of a third novel, novella or even non-fiction, I can’t say at this stage, but I hope to write more about Dutch wartime history and make sure it’s never forgotten. Keep reading these posts and I’ll update you on my latest thoughts.